For history lovers, we offer an economical way to tour four Lexington historic homes. Stop by the Lexington Visitors Center at 215 West Main Street,on the lower level, and for $25 you can purchase one ticket that grants admission to the Mary Todd Lincoln House; Ashland, the Henry Clay Estate; the Hunt-Morgan House; and Waveland State Historic Site. The ticket is valid for one year from the date of purchase. The Lexington Visitors Center is conveniently located about one block from the Mary Todd Lincoln House and is within walking distance of the Hunt-Morgan House. When you stop in to purchase your Ticket to History, visit with our friendly Visitor Information Specialists. 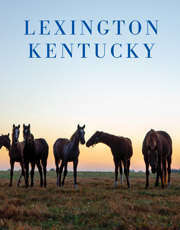 They love to help history buffs discover other significant historic sites in Lexington and the Bluegrass Region.